The DVC will host Congressman Adam Schiff (CA-28), ranking member of the House Intelligence Committee and an increasing target of Trump insults. We’ll get to hear some of the inside story of Congressional defense against Trump/Republican attacks on our democracy. 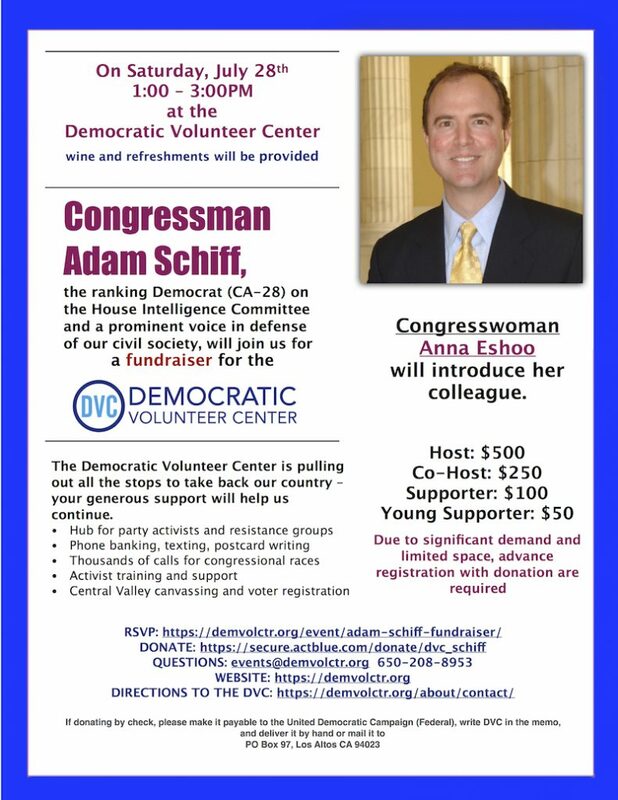 Registrations for the July 28th fundraiser for the Democratic Volunteer Center with Adam Schiff have been extremely robust. Unfortunately, the DVC headquarters does not have infinite capacity for safe attendance at this event, so we must limit attendance to 250 people. To be fair to those who have already donated or plan to donate for the event, we now need to require all attendees (including those who have rsvp’ed but not already donated) to make their donations in advance in order to secure their registration for the event. UPDATE: All registrations from now on will be for a waiting list. We will notify you by phone or email if a space opens up. Please email events@demvolctr.org or call 650-302-8760 with any questions. If you have rsvp’d but not donated, then you must donate (click here) by Wednesday noon to secure your registration for the event.